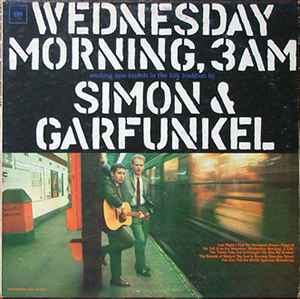 Simon & Garfunkel ‎– Wednesday Morning, 3 A.M.
B6 Wednesday Morning, 3 A.M.
First pressing on red labels stating ''Guaranteed High Fidelity'' in the bottom rim. Let me lay the backstory on you first, and I’ll begin with the album’s title Wednesday Morning, 3AM, debuting in 1964, coming from the fact that on a Wednesday night, our dashing duo had just finished their last song at 3AM in a Greenwich Village folk club, and were homeward bound to their digs in Queens … or perhaps it all had to do with the song “Wednesday Morning, 3AM.” Regardless, the iconic photo was taken at that Fifth Avenue and 53rd Street stop. The photo shoot proved problematic as several hundred images where taken that turned out to be unusable due to an all familiar suggestion that had been penned on the tiled wall, which inspired the writing of the future song “A Poem On The Underground Wall,” from the album Parsley, Sage, Rosemary and Thyme. It’s not uncommon for an initial outing to be a mixed bag of original material, covers, and arrangements of traditional songs, which was the case here, with their cover of Dylan’s “The Times They Are A-Changin’” ushering them into the inner circle for all things Bob Dylan, and gaining cross-over fans. For the most part the album was largely acoustically focused, and largely unremarkable, so unremarkable, along with the invasion of The Beatles, that Simon & Garfunkel broke up, with Paul headed off to the UK, and Art going back to school. It wouldn’t be until the track “Sounds Of Silence” was reworked as the opening number on their following album, and was presented in a more haunting rock n’ roll manner, that Simon & Garfunkel secured a place on the musical map and never looked back. The release was so overshadowed by the Sound Of Silence album that many people completely overlooked it, and with that hit single being on both albums [though as differing versions], it caused confusion for many. Regardless, what shines most on this release are the traditional and cover songs, where the duo come off as energetic, harmonious, and emotionally sincere. While sounding sincere and ambitious, the album comes across somewhat disjointed because of this non-original material, and the fact that the songs seemed to have been chosen at random, without consideration for the contextual flow needed for a concise body of work. While certainly better than their Tom & Jerry [with name taken from the Tom & Jerry cat and mouse comic] material, they’ve stepped headlong into an Everly Brothers / Peter, Paul and Mary-ish adaptation, making the album sound a bit flat, thin, campy and uninspired. I’m trying hard to bring something positive to the table, yet in all honesty, there is little I can say about this album to make it seem worth not only your while, but your investment. The one thing Simon & Garfunkel did, which was similar, though not as dramatic as Dylan at Newport, was that they stepped out of the crooning vocal era of the late 50’s, and into the folk scene, and then nearly single handedly reinvented the folk attitude, flying under the banner of folk-rock, though still heavy on the folk side … so yes, in a sense this is an important album as a bookmark of sorts, though holds little of lasting value.